Agreed. As a worker at a museum which is mostly focused on children, I sometimes have to compromise with my boss (curator of collections) as to how an exhibit with fossils should be oriented. Yes, there should be some interactive activites for kids, but I think museums can do better then a sandbox (I shouldn’t be talking! My museum has a fossil hunting sandbox next to the playground, but that was made before I worked there, and I cringe at the sight of it!). Your critique is well expressed, and I’m sure comes from a genuine place. It does, however, arise from a certain set of assumptions or values – chiefly that the primary role of the science museum is as a place of learning. More specifically, that the type of learning that should happen is of acquiring knowledge and understanding, perhaps extending into learning new skills. My personal opinion is that this should not be the primary driver of science museum design. Learning is paramount, but our institutions are far better positioned in the educational space to facilitate types of learning such as changes to attitudes and values, and enjoyment and inspiration. I think the museum environment is not well suited to the acquisition of deep knowledge or transferable skills – we simply don’t have the learners’ attentions for long enough, nor have enough scaffolding or active teaching resources to attain this. Giving our visitors a place in which to play, explore, be creative, collaborate, experiment, enjoy, gain appreciation for etc. I think does far more for scientific literacy in our society than insisting that visitors participate in a simulation of ‘real’ science. Fossil sandpits aren’t the best thing in the world, but I don’t think they’re that bad. The alternative proposed would suit a heavily scaffolded program for ages 10-15, but I can’t see it working with casual visitors or younger children who simply don’t have the cognitive skills to make the connections that you want. Is it unreasonable to provide these audiences with an experience that is, admittedly, far shallower and far less realistic, but one that has a chance of opening their minds a little more, or changing their attitudes about science – palaeontology or otherwise? Either way, thankyou for taking the time to write this up. As a museum designer looking to develop a new space for very young children, this has given me something to think about before just deciding ‘yeah, put a fossil sandpit in’. Hi Alex, thanks for the thought-provoking comment! I must be too deep in a like-thinking bubble, because I don’t think I’ve ever heard it expressed (or at least articulated so clearly) that a science museum *isn’t* fundamentally a place for learning. I’m not sure I agree with your sentiment, though. Play, cooperation, wonderment and so forth are all great things to work into the museum experience, but surely they should all be in service of gaining (or at least gaining an appreciation for) content knowledge. That’s the essence of a typical natural history museum’s mission statement, anyway. I see collections-driven lifelong learning as the core value a museum provides to its community, and wavering too far from that risks putting us in competition with other kinds of attractions. Part of my frustration with sandbox digs comes from my experience facilitating family programs at a real fossil quarry. I found that prior, inaccurate experience with sandboxes negatively influenced some visitors’ enjoyment of the real thing – they were given an expectation that did not match reality. More broadly, I think its a net positive in the long run to find ways to introduce visitors to accurate information, even at a very young age. Thanks again for your comment, and for opening up my perspective! Thank you for the article, it was an interesting read. As a mom of a dinosaur focused 4 year old, I have to disagree with your stance on sand boxes. I do all I can to Foster this intense interest in dinosaurs and have been working to Branch out into the actual science of palentology to deepen her understanding. I impress upon her the importance of scientistfic curiousity that drives you to new discoveries. The Sand pit allows her to transform into a palentologist where she can match up this extrodinarily long concrete bone to a diagram to determine what it is. Now is this how most kids act? Probably not. If this sandpit had any other focus than dinosaurs she wouldn’t care much about it. But for bringing in new interest and fostering a love for discovery, I think the sand pit is an excellent starter. Thanks for weighing in, Katie! It’s always good for me to hear voices from outside the educator bubble. And it’s fantastic to hear that your daughter is on her way to being a paleontologist! Thanks for the article about the negative aspects of the fossil sand boxes. I would have to disagree about your stance on these interactive fossil pits too. I don’t think you understand the principles of interpretation and engagement in museums! I work as an educator and interpreter at a museum where we regularly bring out a 2 metre square ‘dino dig pit’ with casts of large dinosaur bones imbedded in the bottom and covered with rubber crumble. 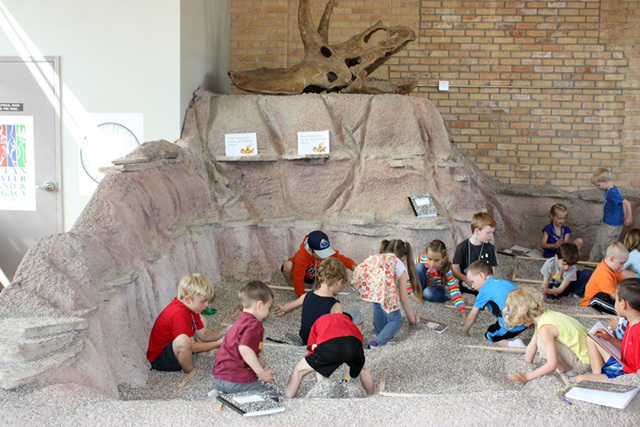 It is very, very popular and while some children and parents DO just use the dig pit as a play space, many children (and their adult supervisors) are learning about dinosaurs and palaeontology along the way. Partly this is because we provide interpretation for the activity. The children are encouraged to get dressed up as ‘palaeontologists’, then record what the ‘find’ on a data sheet, which requires them to work out what the bone is, and which dinosaur it comes from. This is also supported by interpretation panels (written for young families) that talks about how palaeontologists REALLY find and dig up fossils, and staff who are engaging with the children and parents in the pit. Because we can’t provide a real-life palaeontology dig in the museum context (and I have participated in real digs myself), a dig pit is a great way to get children excited and interested in palaeontology. I think most children understand that this is not a ‘real’ dig. Like the principles of interpretation espoused by Freeman Tilden, if we get them excited, light the spark, make connections, the learning will follow. We can of course add the activity Ben mentioned – for older children with appropriate scaffolding and facilitation – but it should be an ‘extra’ activity not in place of the dig pit! Incidentally, my daughter now 22, used to absolutely adore this activity, and would go home to create her own digs in the back yard. She is now doing postgraduate palaeontology research in a fossil cave! She attributes much of her continuing passion for science in general and palaeontology specifically, to her childhood engagement digging in those ‘fossil sand boxes’. Now that is a win for the museum’s fossil dig pits!